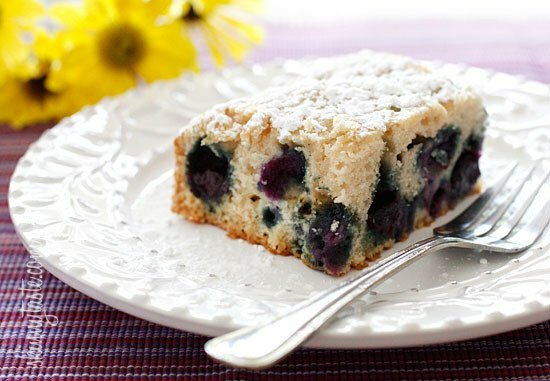 Easy Blueberry Buttermilk Cake – A simple summer cake loaded with fresh, juicy blueberries in a lightly sweetened, moist buttermilk cake. And yes, it’s light too! 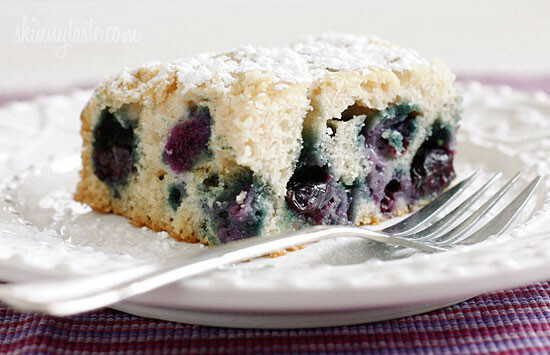 I love having blueberries in any dessert because it adds that glorious moist addition to every bite. 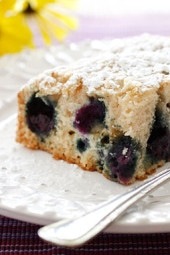 A few other recipes I enjoy are Blueberry Banana Bread, Blueberry Oatmeal Muffins (which are also gluten free and dairy free), Blueberry Scones and Blueberry Peach Crisp. 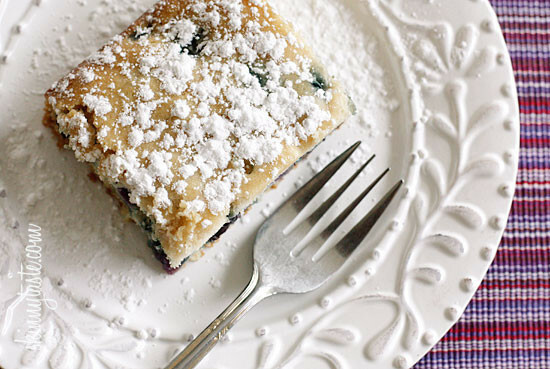 The blueberries are the star of this cake, and I didn’t think it needed any frosting. I simply topped it with a little powdered sugar before serving (completely optional) or you can even serve it with some whipped topping (or Greek yogurt) on the side. I took a poll on the Skinnytaste Facebook fan page and asked what kind of baker you are, one who bakes from scratch or one who prefers quick recipes using a box cake as an ingredient, and the overwhelming response was you all like to bake from scratch! 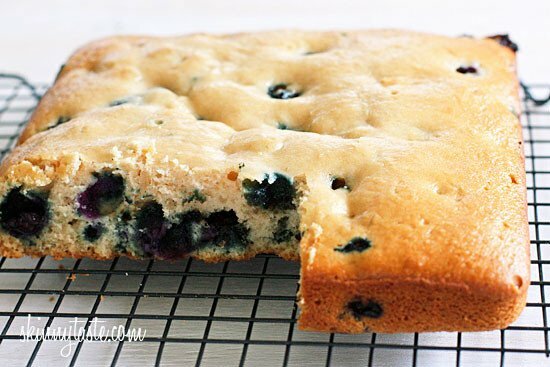 So I set out to make this cake loaded with fresh blueberries without all the butter you would normally find in most cake recipes, and I was so pleased with the results. You will be too!! 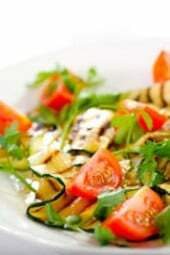 Baking low-fat is tricky and requires a few rounds of experimenting. This luckily only took two attempts – first attempt I didn’t use buttermilk and used double the apple sauce and although it worked, it was a little dense where this final cake is perfectly moist and fluffy. Thumbs up all around in my house with the final version, from my 2 year old to the adults! Grease a 13 x 9 inch baking pan with baking spray. In a large bowl combine flour, baking soda, and salt in a large bowl. 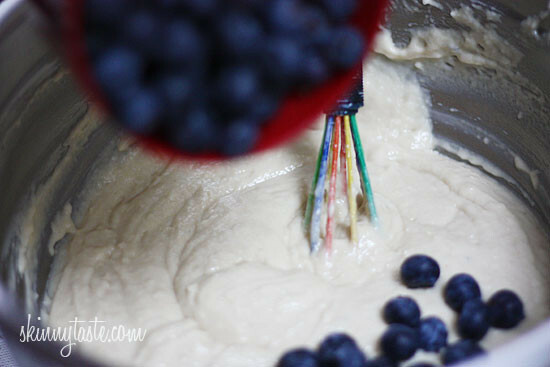 Using a hand mixer or stand mixer, in a medium bowl, beat sugar and butter for about 3 minutes. 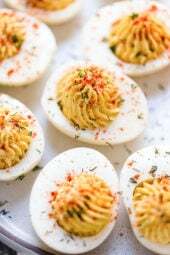 Add egg and egg whites one at a time and beat until combined. Add buttermilk, vanilla and applesauce until incorporated. Add wet ingredients to the flour mixture and stir until just blended. Place the batter into the prepared cake pan; bake cake until a toothpick comes out clean, about 30-32 minutes. Note: For the photo I made half of the cake using a 9 x 9 inch pan for nine servings, same baking time but the recipe is written for a full sheet cake. 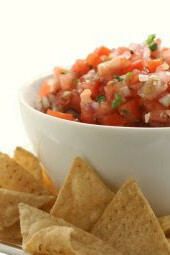 I’ll leave it up to you how many servings you want to make! *If you don’t have cake flour, here’s a great tip on how to make your own from Joy The Baker. I’m sure you can do this with whole wheat flour too, but I think it will effect the taste and texture. Seriously incredible – I will be making this often and for whenever someone comes to visit – words cannot express how delicious this is! 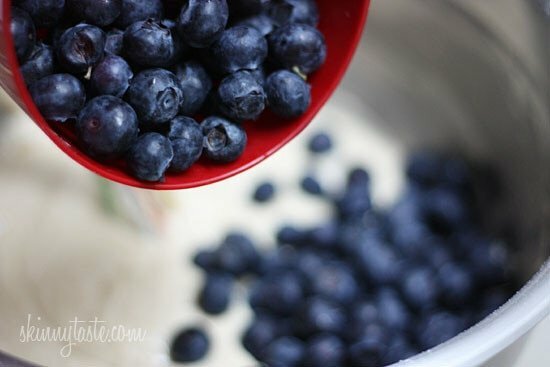 I know this is an old post but I just made this as muffins to get rid of buttermilk and they are good, I am allergic to apples so I replaced with bannanas and did half white sugar half brown and frozen blueberries with some lemon juice. I did find that the berries sunk but still tasted good and you definitely don’t taste the bannanas. Just thought I’d let people know bannanas work In place of the applesauce!